"Once you have a baby, you won't be able to travel anymore," says SO MANY PEOPLE! Except they are so wrong!!! My husband and I recently took our 4-month old daughter on her first international trip to England and Malta from Toronto, Canada. How did it go? Excellent! Yes, even flying with a 4-month old baby went well because we were prepared with our baby travel checklist. I actually felt more excitement travelling this time around then I have in a while because I was exploring a place not just through my eyes but also my daughters. Watching her interact with locals and amazed by the shapes, colours and smells of a new place brought me so much joy. It's as if you're experiencing life for the first time alongside this precious new being. Now, when it came to planning our trip, it took more time since this was all new to us. The first step was calling the airline beforehand to get a FREE upgraded front row seat (not first class), then I request a bassinet for my seat. After that, I called my travel insurance company to get my daughter covered. What I found out from doing this was I could register under my travel insurance at no extra cost and she would be completely covered for the same things as me. I did have to call and add her to my plan though, which something I highly recommend doing before stepping foot out of your country. I can't emphasize how important travel insurance is, especially now that you're travelling with your baby. You can book World Nomads Travel Insurance here. Be sure to read all the fine details to make sure you're covered for everything. Next, what to pack? I was learning about an entirely new category of travel and now I can pass on my newfound knowledge to you. In this video and post, I'm sharing my Baby Travel Checklist. The following are all of the items I brought AND used; I've linked each item to my Amazon store. You can also download my Baby Travel Packing Checklist PDF and print it off. 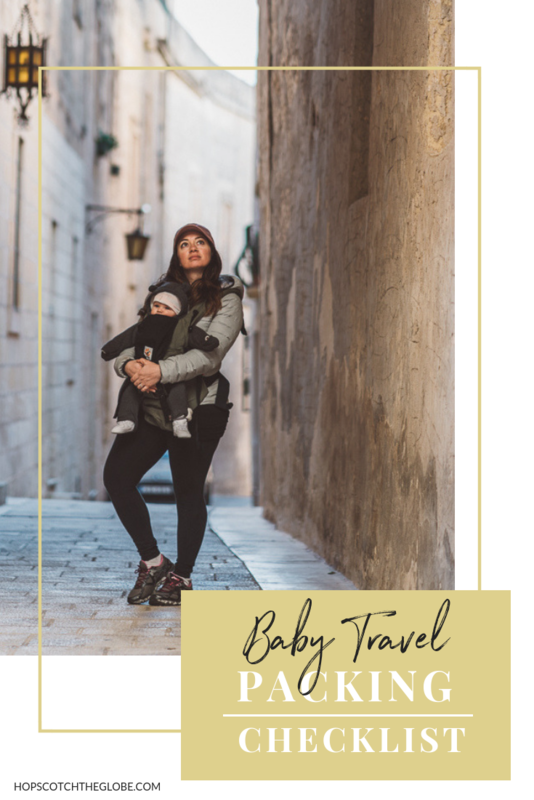 Once again, you can download a printable PDF of my Baby Travel Packing Checklist. Have you traveled with your baby? Do you have your own baby travel checklist you’ve curated? We would love to hear your tips and stories below! Let's encourage those on the fence that it is indeed not only possible but great for both the parents and baby. HI Kristen. Great list of things to pack. I have a few quick questions if you don’t mind. (Maybe you can address this in a future post). How do you deal with the time change and sleeping for babies? Was it easy for your baby to adjust? Also, we do cloth diapering too. Did you pack some disposable diapers too, just in case? Or did you just book places with a laundry machine so that you wash the cloth diapers. Nothing quite like family travel especially when you can travel with the kids. Looking forward to your future blogs on child friendly place and hotels now that you will be traveling with her. Yes, its such a different and beautiful experience which I’m sure will get even better as she gets older.